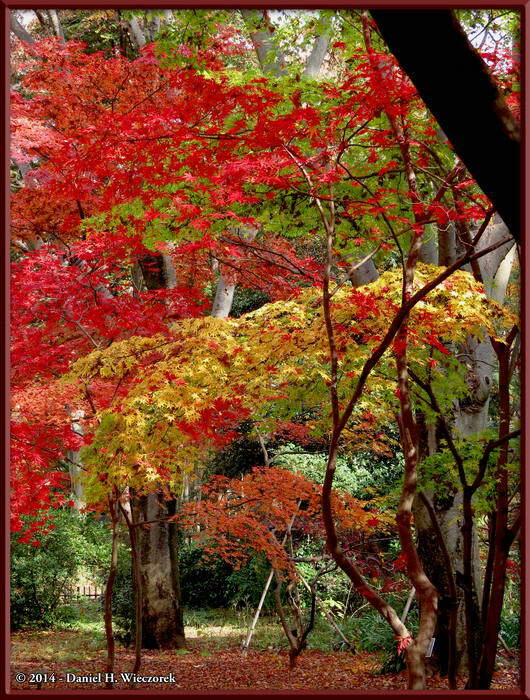 This is Page 1 of 3 - the best of December 2014! This page actually begins (and ends) with November 30th, the final day of November, which made it too late to post these photos with the other November photos. 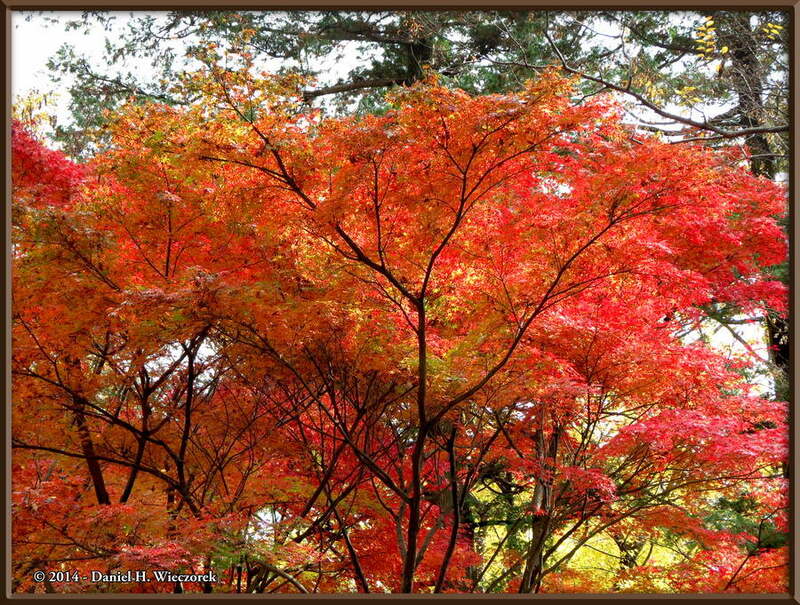 All of these photos were taken during our annual Autumn Color trip to Jindai Botanical Garden. 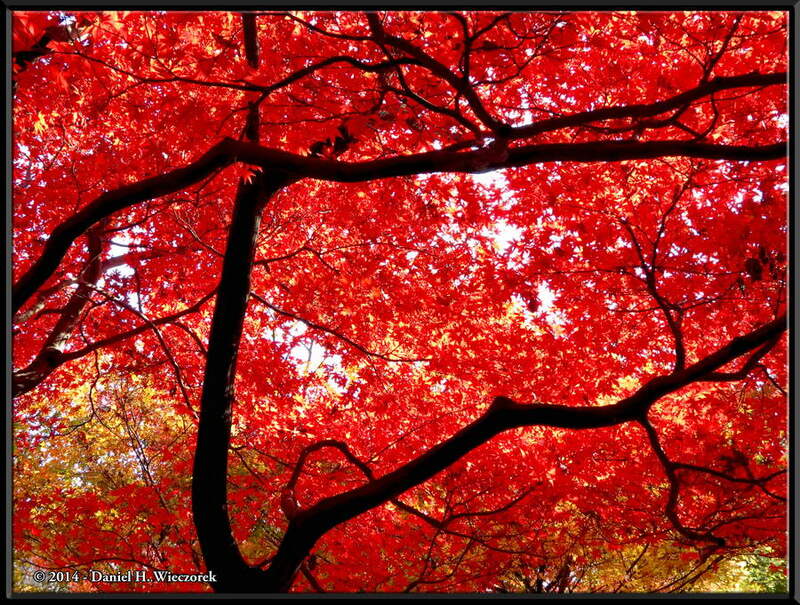 Click on any thumbnail to begin. 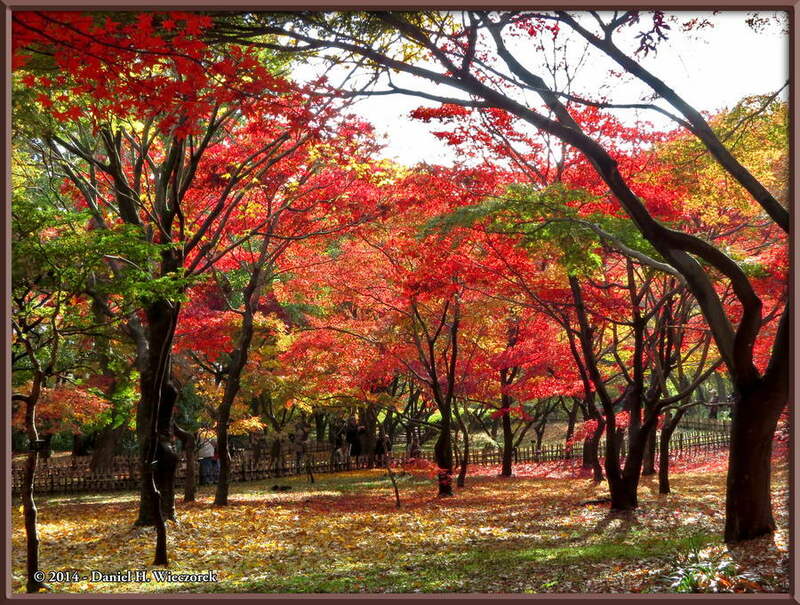 On November 30th Kazuya and I rode our bicycles to Jindai Botanical Garden. It's only about a 15 minute bicycle ride from our apartment, so not very far. 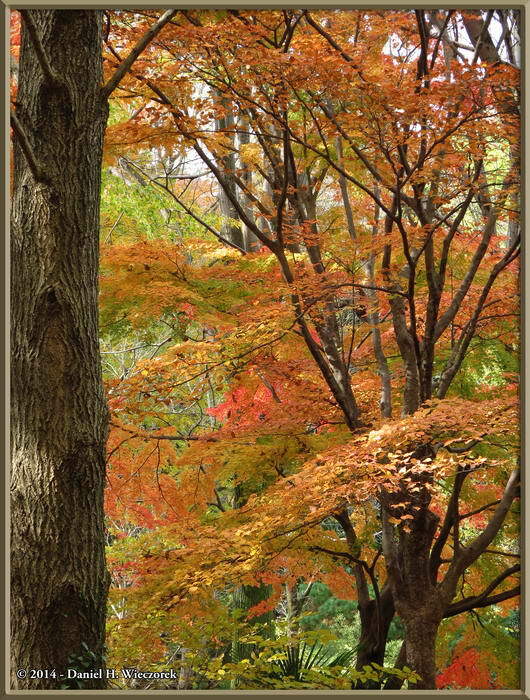 We rode past 2 weeks before and the fall colors had barely begun to show up yet, so we did not go in, but decided to wait for 2 weeks. 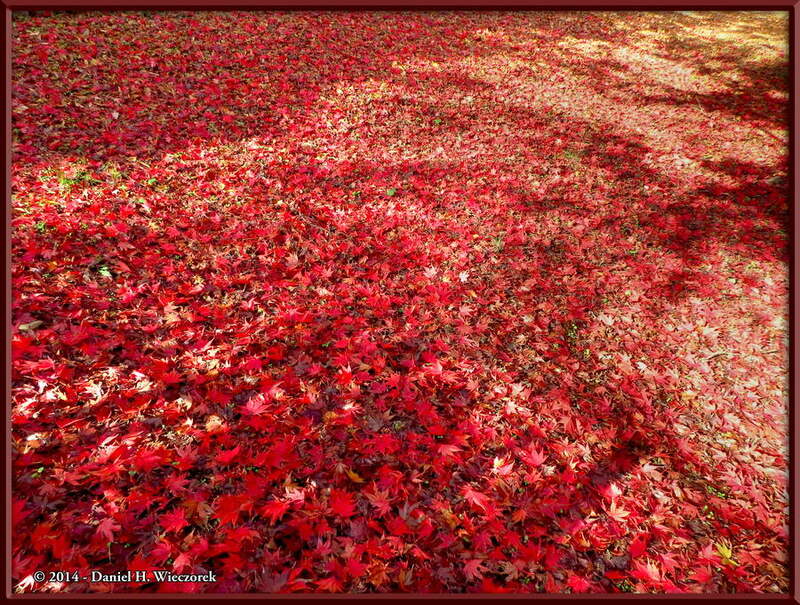 Well, it ended up that today it was a bit too late for the peak of fall colors, even though they were still good enough to be impressive. 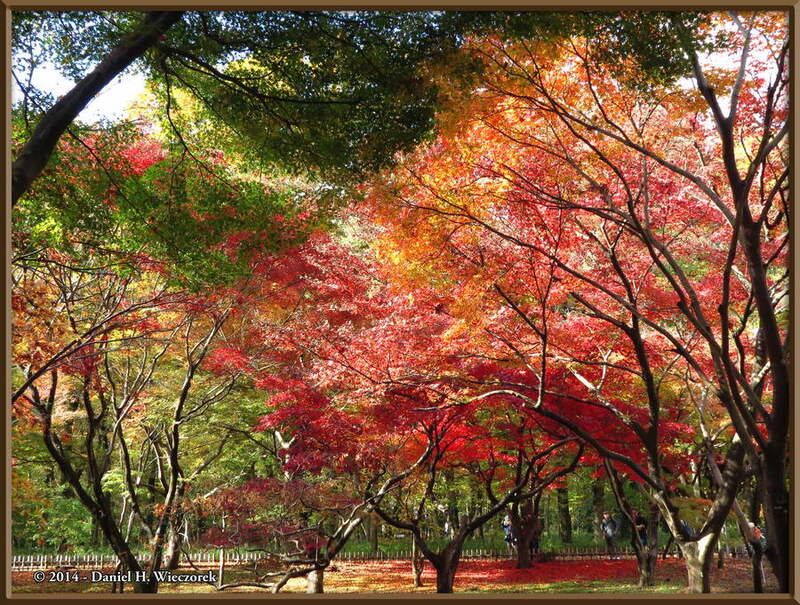 The two photos in this row were taken just outside of the entrance. 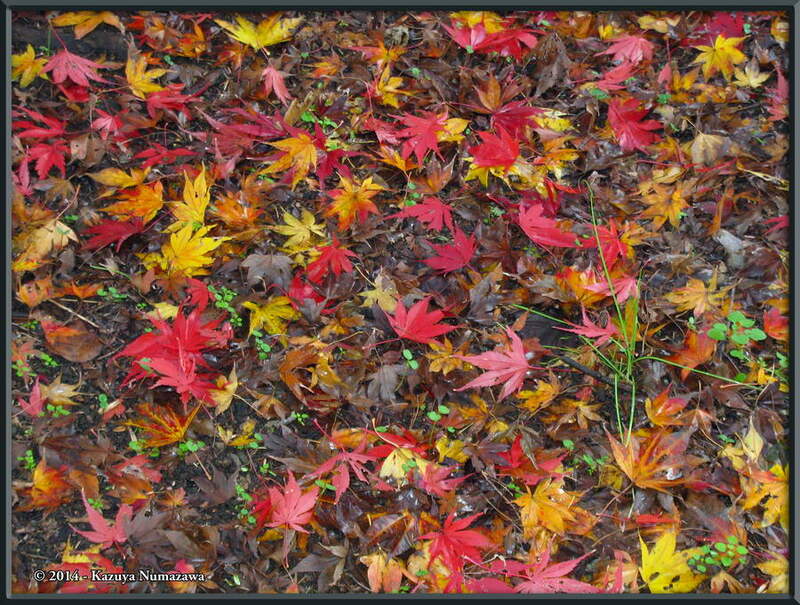 The first one shows some green, red and yellow colors. 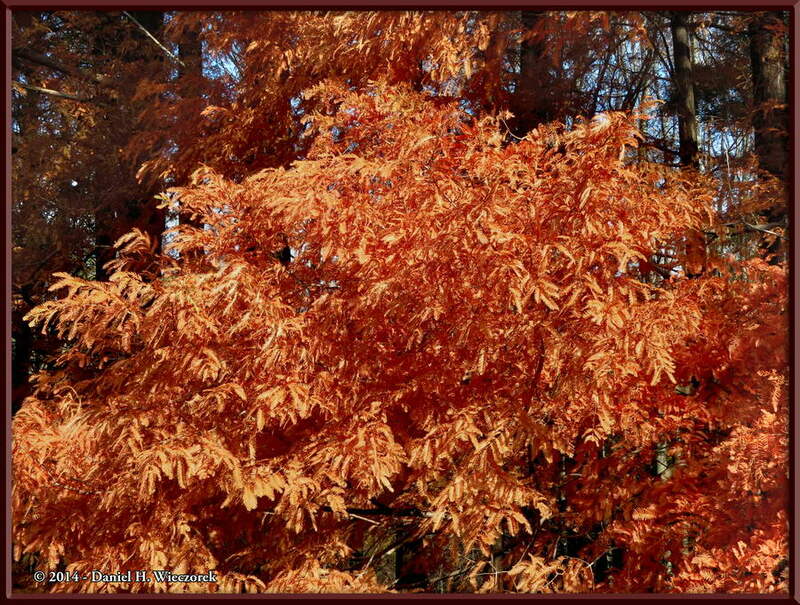 The second one also shows some brown in a tree which is not cooperating with the beauty of the season. 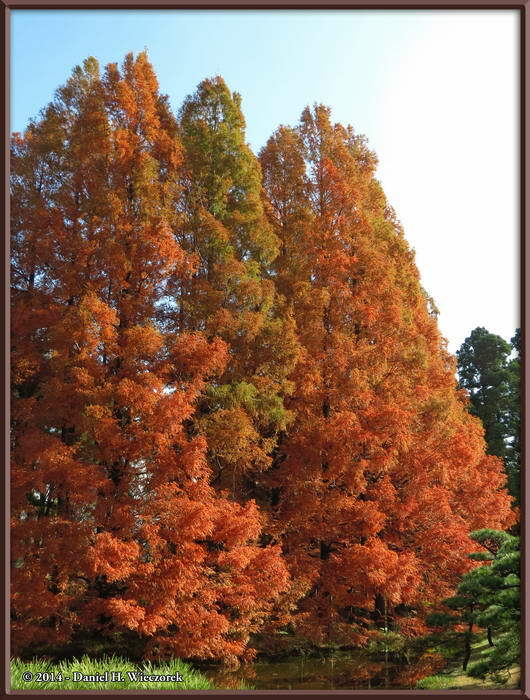 The two photos in this row show the interesting brick red colors in the Metasequoia (Metasequoia glyptostroboides) at the small pond. 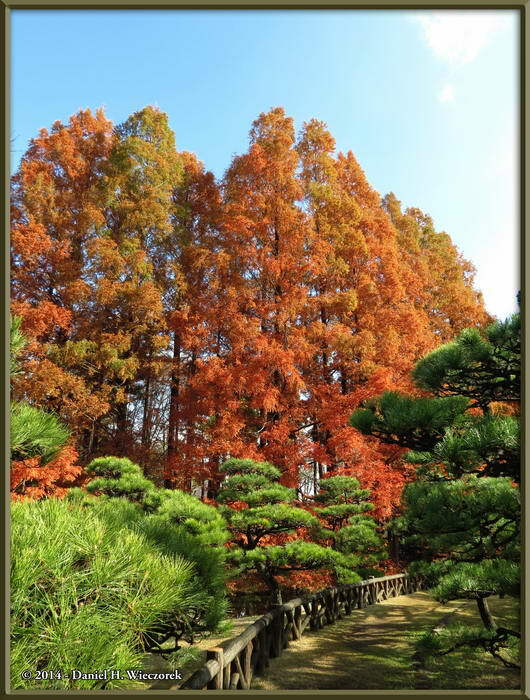 The first photo in this row is zoomed in to a large branch of a Metasequoia (Metasequoia glyptostroboides) and shows the brick red color very nicely. 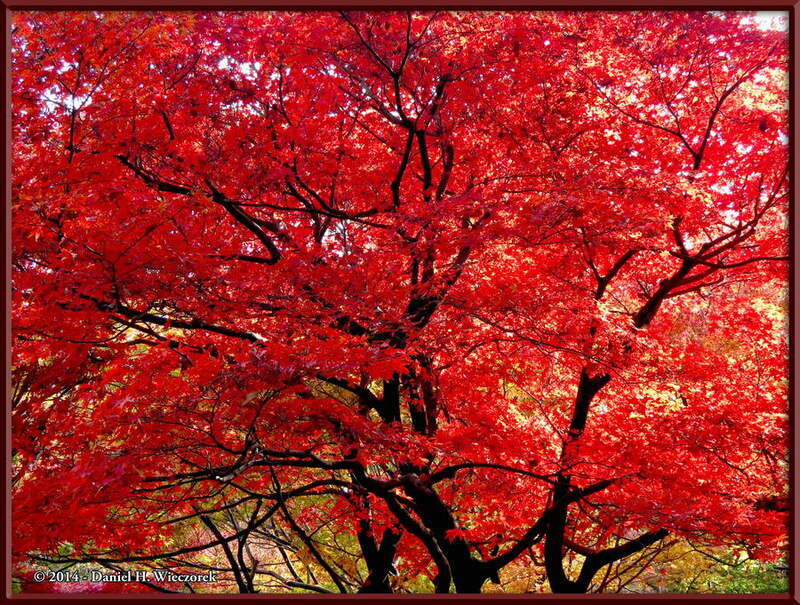 The second and third photos show a beautiful red maple at the Maple Garden. 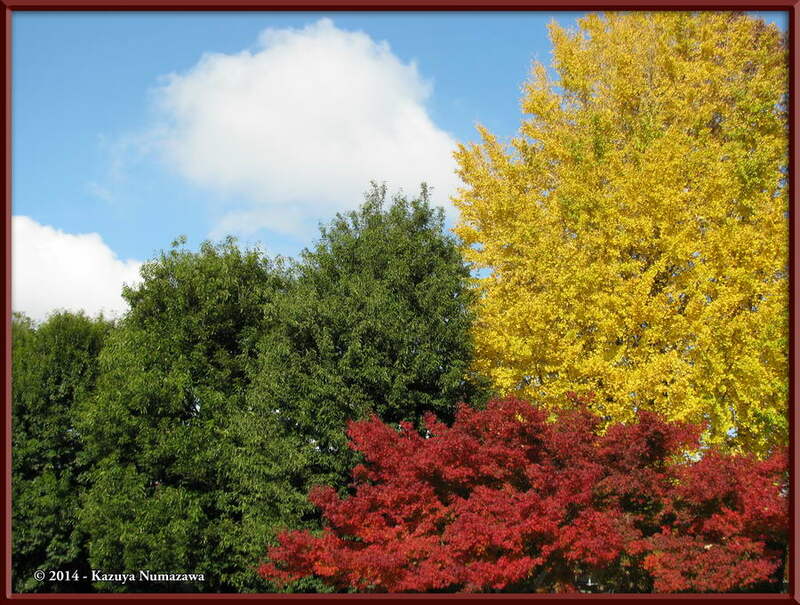 In this row are three photos of Autumn Colors which were all taken in the Maple Garden. 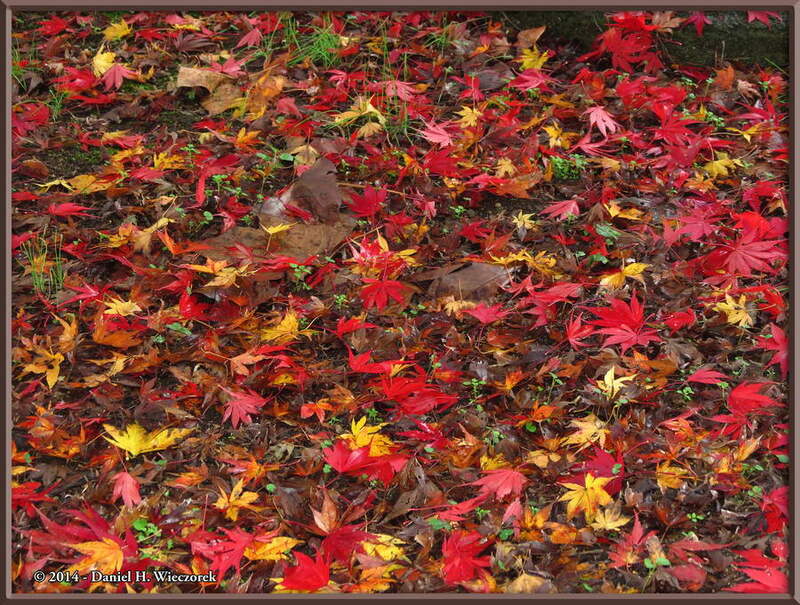 The first and third photos are of the beautiful leaves on the ground. 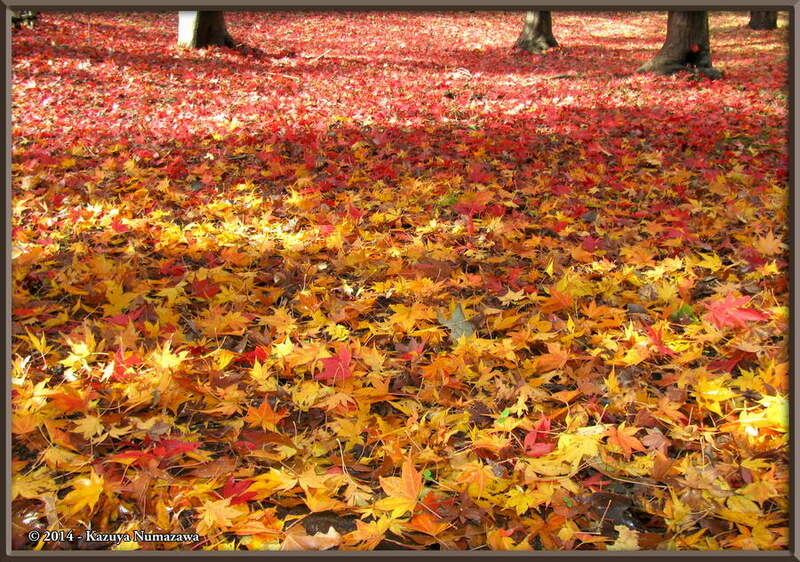 In the center photo you can also see that a large percentage of the leaves from that beautiful tree are already on the ground. 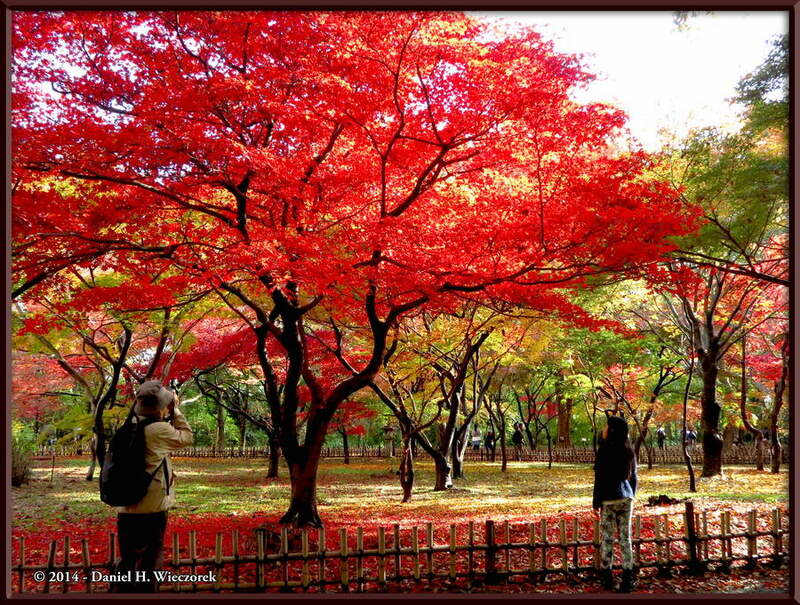 Here are three beautiful shots of autumn colors. 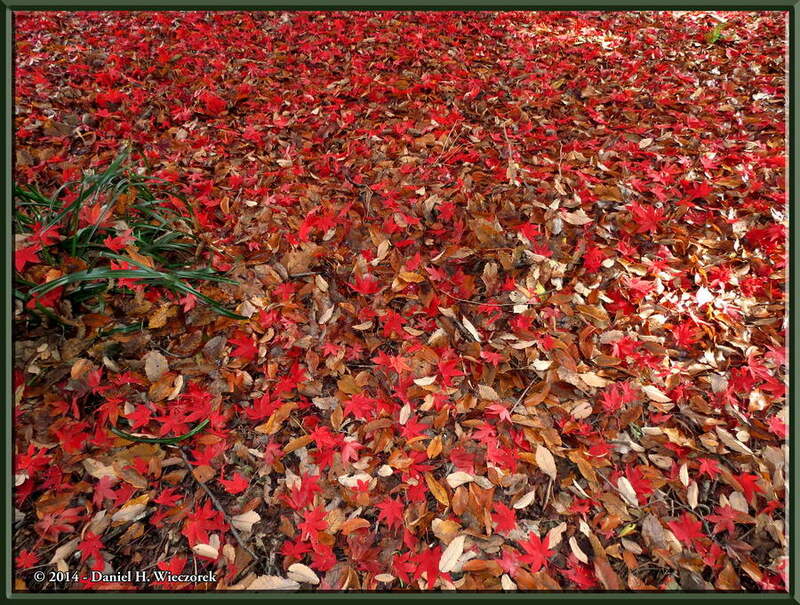 In the third photo please note the rather sharp boundary line between the yellow leaves and the red leaves on the ground. 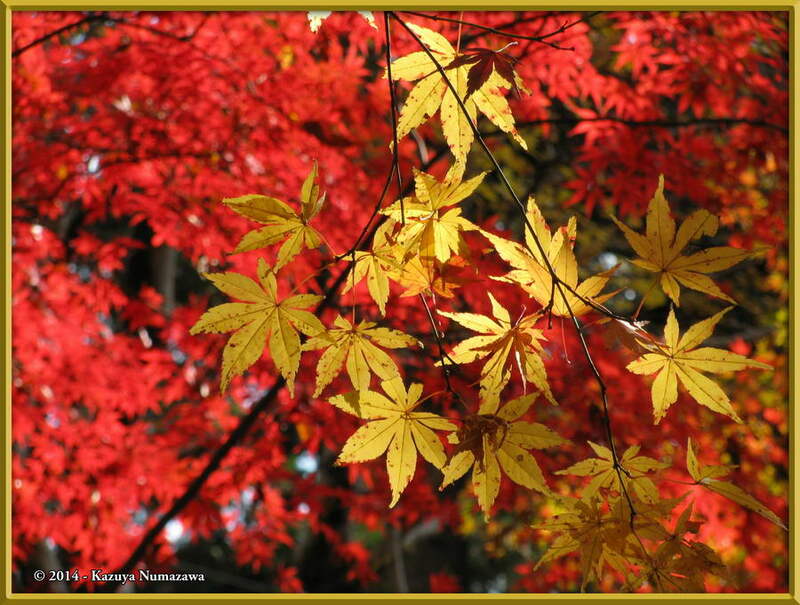 There must not have been much wind since the leaves started falling or else the red and the yellow leaves would be more mixed together. 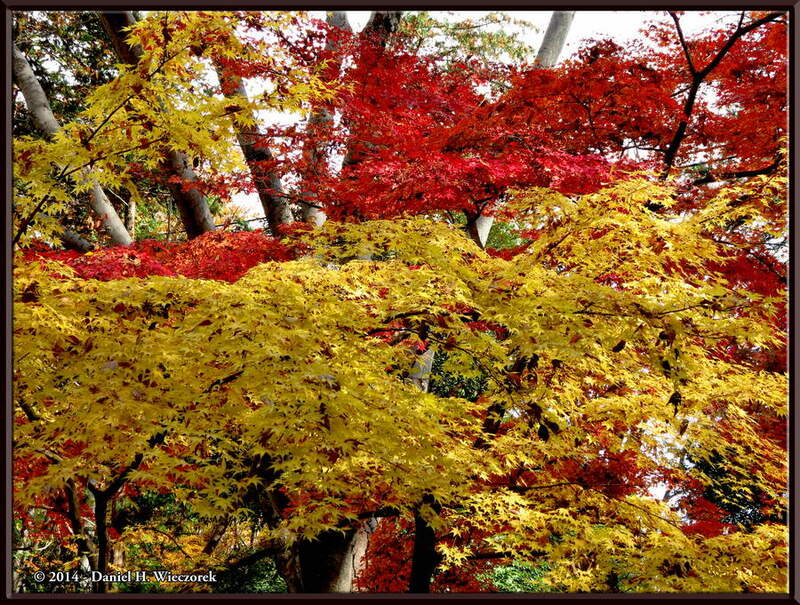 The first photo in this row shows more leaves on the ground, while the second and third photos show nice autumn colors in the trees. 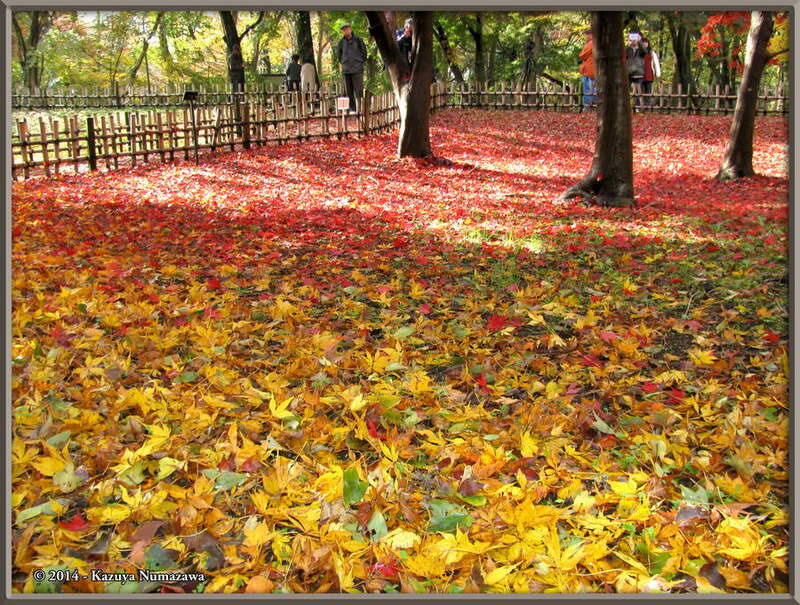 The first and third photos in this row again show beautiful leaves on the ground and the center photo shows beautiful leaves in the trees. 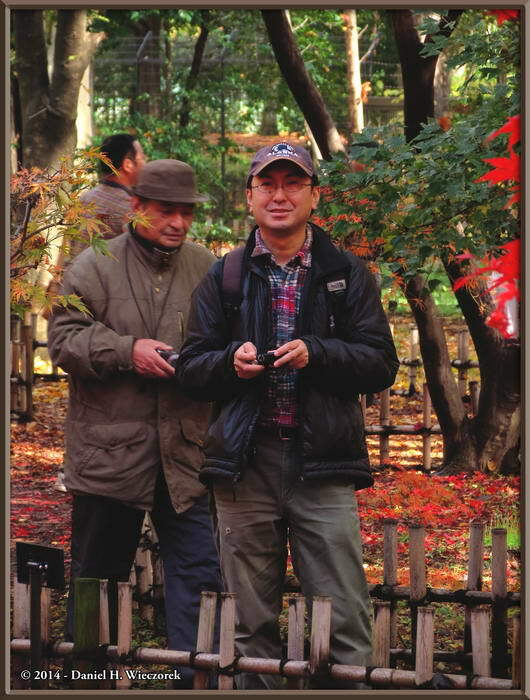 The first photo here shows Kazuya smiling while taking autumn color photos. 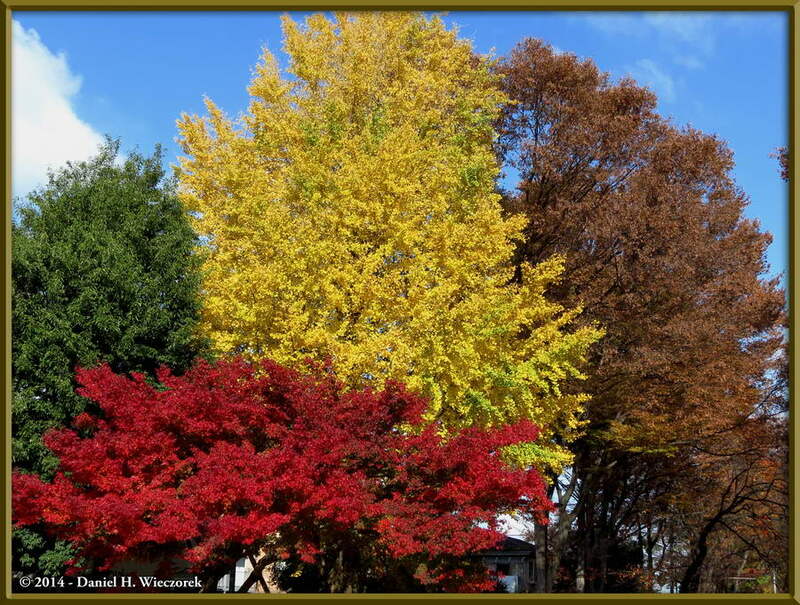 The second and third photos show reds, yellows, greens, browns, oranges and more colors. 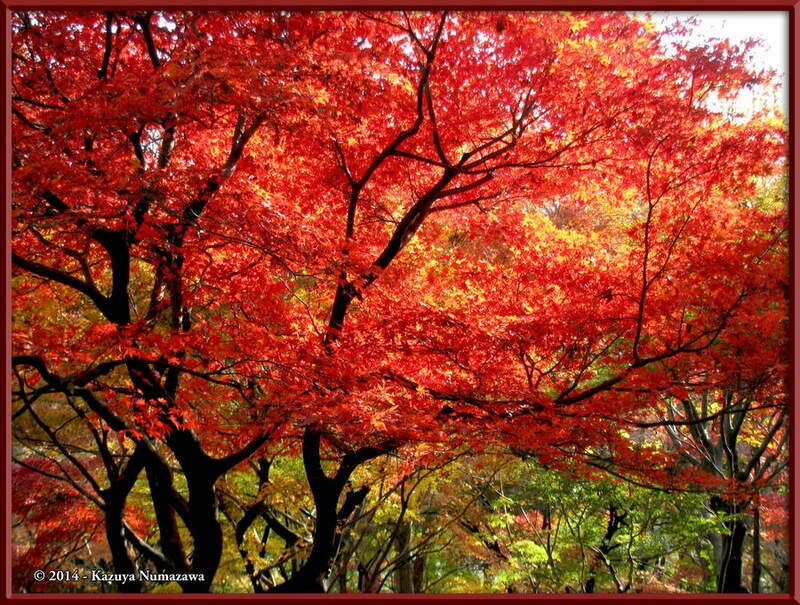 Kazuya zoomed in to get the first photo in this row - a single yellow-leaved branch against the bright red colors. 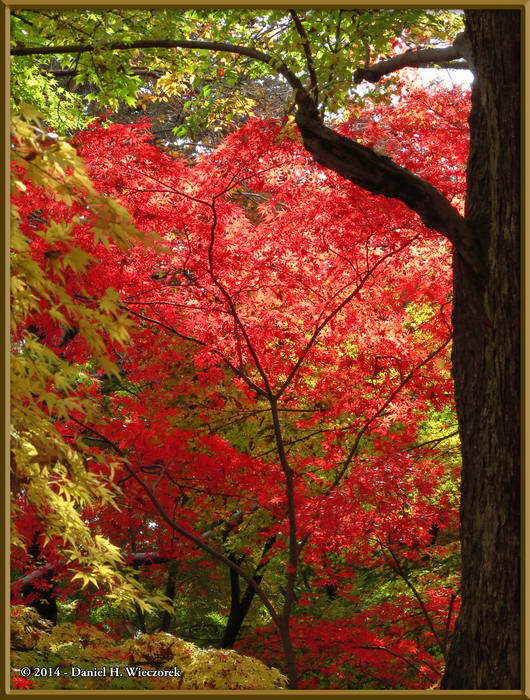 The second photo also shows yellow against red, but it is zoomed out. 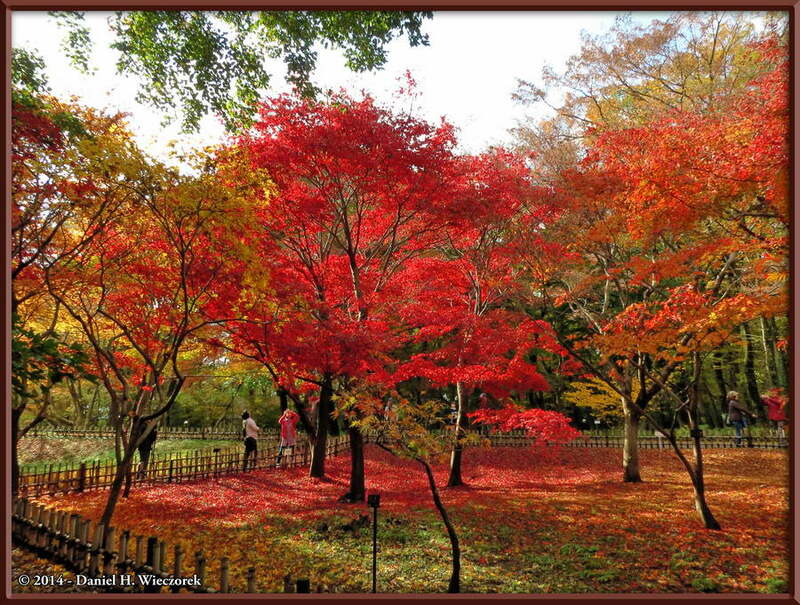 Here are the final two photos we wish to show you of our trip to Jindai Botanical Garden for Autumn Colors. 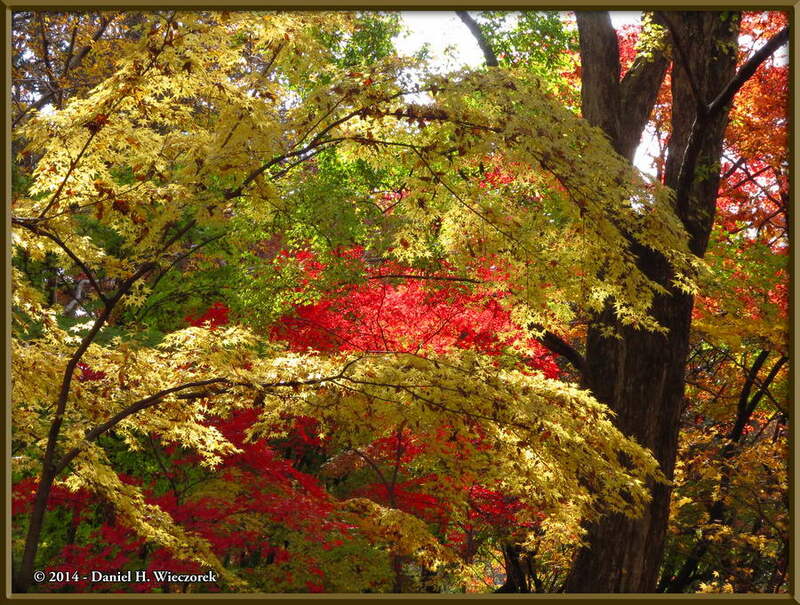 Sorry, now there are no more fall colors to be seen until next year.